David buys microfilm-containing maracas at a music store. Filming Dates: June 27-30, July 1, 1966. Original Air Date: October 10, 1966. Rerun Dates: June 12, 1967 (NBC); September 26, 1970, April 3, 1971, July 1, 1972 (CBS); October 7, 1972, May 19, 1973 (ABC). �I�m Not Your Stepping Stone� by Tommy Boyce & Bobby Hart. �The Kind Of Girl I Could Love� by Michael Nesmith. After a drive in the city in The Monkeemobile, David insists on buying a new pair of maracas at the nearby store, even though his mates insist he has a pair of maracas already. On their way there, David notices an ice cream man talking to a popsicle (who is actually top Central Intelligence Service [CIS] operative Honeywell, incognito as an ice cream vendor, reporting back to his chief via a popsicle-microphone). At the music store which is really a front for enemy spies, Russian spy agent Madame Olinsky gives instructions to her sidekick Boris who just placed microfilm into one of a pair of red maracas. She tells him his contact will be a short man who will ask for a pair of red maracas and he�s to tell the man he�ll give him some for $6.00 where as the contact will reply he only has $0.50 and he�ll tell him there his. After noticing the ice cream man outside, she decides to exit through the secret door since the guy is a CIS agent (after all, he is talking to a popsicle!) and departs through a harp case. The Monkees enter the store where David asks for a pair of red maracas and Boris mistaking him as the contact repeats what Madame instructed and when David winds up answering correct Boris gives him the maracas and sends them through the secret door too. Then a midget shows up asking for the red maracas and Boris realizes he got Olinsky�s instructions crossed. Later at the discotheque, The Monkees are on stage performing �The Kind Of Girl I Could Love� when David notices one the maracas has a microfilm inside and he puts it in his pocket. Having tracked The Monkees to the discotheque, Madame and Boris arrive dressed as hippies and confronts the band at gunpoint after their performance demanding the microfilm which leaves Peter in tears. For a diversion, Michael introduces the agents as a famous folk singing duo �Honey and The Bear� who will sing a protest song. The agents are soon shoved onstage where they reluctantly sing off key and Micky starts the crowd booing and hurling objects and pillows at them in which the foursome make their escape. At the CIS (Central Intelligence Service) headquarters, CIS operative Honeywell shows the chief a secret filming of each Monkee whom he interviews on different topics. First, with Michael and Peter outside questioning them about politics, then Micky at the front door about responses to many faces and then David at a news stand where he winds up singing and dancing to the song �Swanee River� leading a chorus. The Monkees are called into the HQ where the chief enlist their help in capturing the two spies warning them of the dangers, and informs them of a dedicated CIS man, Harold B. Schwartz, who just a week ago nabbed a whole nest of spies. Back at the pad, as The Monkees tool around on their unicycles with training wheels, Michael disapproves of this, since music is more their bag than espionage, but Micky tells him that there�s nothing to it, since they�ve seen every spy movie, and The Monkees engage in a fantasy sequence as trainees in a spy school, under the tutelage of Micky. First he briefs them on different gadgets: for Peter about cufflinks that has a hidden tape recorder inside, David, a tie pin that has a pill he takes when captured, and Michael, a lighter that has a secret camera inside along with Yamashida, a tiny Japanese cameraman! Then Micky teaches David, Peter and Michael karate moves using Yakimoto, a large Japanese man with whom Micky demonstrates two karate chops on who then retaliates by using karate chops on Micky�s stick, pencil and a board while he�s briefing them on weapons. Realizing they have to meet Honeywell in a half hour, The Monkees then travel by unicycles to the briefing at the discotheque where Agent Honeywell tells them of a secret microphone inside a lamp on a table. They are to get the Russian agents to make a confession in hopes of making an arrest. He then leads the guys to another room when a genie appears in a puff of smoke out of the lamp before David (wrong show!). In another room, Honeywell shows them a tape recorder where he will be recording the confession. Madame and Boris return during The Monkees� performance of �I�m Not Your Stepping Stone� and after the song they all gather around the table where the agents ask for the microfilm in exchange for $380. (At first, she intended to pay $400, but Boris used $1.90 for cabfare.) But at first, the quartet attempts to get a confession is ruined with a nod, accidently knocking the wire out, and loud laughing from a couple nearby. When they finally get their confession an angry, impatient Mme. Olinsky demands the microfilm at gunpoint, Michael turns over a roll of film and starts a wild dance to the tune of �All The King�s Horses.� Micky and Peter try to grab Boris who overpowers them leaving them sprawled on the floor out cold while David tries to contact Honeywell on the lamp. Then Madame Olinsky lays Michael out with a karate chop, snatches the film, and escapes with Honeywell in a hot pursuit. The dancers, thinking something new has been added, begin using Karate on each other while Boris gets mobbed first by teenage girls dancing then by David jumping on his back while Peter grabs his leg and Micky tries to crash into him but he's finally pinched in the ear by Michael, and the wild dance ends with him on the floor with Michael holding his ear and the other Monkees on his back. Honeywell returns without Madame who escaped but at least Boris is captured. Somewhere in Red China at a spy headquarters, Madame Olinsky presents the film to a group as containing America�s latest weapon that will change the course of modern warfare. As she starts showing the film, she�s shocked when the film turns out to be just a sequence to the song �Saturday�s Child� of The Monkees in their maddest capering: from on the beach in bathing suits to riding on camels, dressed in scuba diving outfits on lawn and dancing with Honeywell and the teenyboppers back in the discotheque, which leaves the humiliated Madame bound and gagged in a chair in return. This was the writing debut of The Monkees for the team of Gerald Gardner and Dee Caruso, who have penned the largest number of Monkees segments: 21! They just finished a stint composing scripts for Get Smart (NBC/CBS, 1965-70), so it's natural that �The Spy Who Came In From The Cool�, their first Monkees script, emphasize on espionage! (In one scene in �The Spy Who Came In From The Cool�, Micky can be seen imitating Don Adams as Maxwell Smart, Agent 86 as, in the Chief's office, he speaks into a telephone, "Hello, chief? Send in Schwartz, Harold B.!") Gardner & Caruso later reteamed with director Rafelson to form Episode No. 17, "The Case Of The Missing Monkee." The two even contributed a script to Gilligan's Island (CBS, 1964-67), "The Producer," which had aired a week before, on October 3, 1966. This was the first Monkees episode filmed in which, during The Monkees' musical sequences, Michael Nesmith can be seen with his trusty Gretsch 12-string guitar (one of 3 in existence; Chet Atkins and Beatle George Harrison being the proud owners of the other two). This was the guitar he would take with him on several of The Monkees' concert tours. Sadly, it was stolen from his workshop years later, but he utilized a rebuilt Gretsch for production on The Monkees' 11th album, 1996's JustUs. The Gretsch was one of two of Michael's most prized guitars - the other was The Black Beauty, his Gibson guitar with which he did the "Day Tripper"-influenced main riff for "Pleasant Valley Sunday" as well as further Monkees and First National Band work. On the date that this segment went to air, The Monkees� first album, The Monkees (Colgems #COM/COS-101), was released. 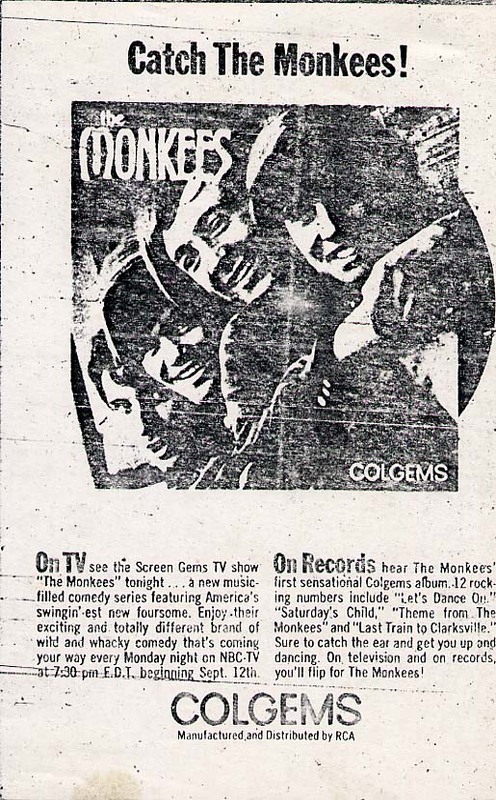 The week of The Monkees TV series' debut, TV Guide featured an advertisement promoting the album and the series - despite the fact that the latter wouldn't be released for another month! It's the only first-run Monkees episode to coincide with a Monkees album release, and �Saturday�s Child� is the only track from The Monkees' newly-minted self-titled longplayer to appear in this episode. A black-and-white still from this episode can be seen on the rear of the More Of The Monkees LP. This episode was repeated on NBC June 19, 1967 with "Randy Scouse Git" (replacing �Saturday�s Child�) dubbed into its soundtrack, and on CBS and ABC Saturday with "All Alone In The Dark" mixed in. Michael Nesmith's �All The King�s Horses,� though showcased here, was not credited in the end titles� song listing. In any case, this was the first appearance of a heretofore unreleased Monkees tune on a Monkees episode. The exact same people wearing the exact same clothes are seen in both dance shots. Michael's electric guitar fluctuates between a 12-string and a 6-string during �(I�m Not Your) Steppin' Stone�. After four episodes' worth of quick-change tomfoolery, �The Spy Who Came In From The Cool� introduced the dream sequence concept on The Monkees. The episode's title is a takeoff on the movie The Spy Who Came In From The Cold (Paramount, 1965). Both �The Spy Who Came In From The Cool� and Episode No. 8, �Don't Look A Gift Horse In The Mouth�, have the distinction of having the longest titles of any episode of The Monkees television series (both being 8 words long)! The shortest title of any episode was No. 58, "Mijacogeo". At the end of the �Saturday�s Child� romp, a clip from the non-broadcast version of Episode No. 10, �Here Come The Monkees�, the Original Pilot Film, wherein the boys burst into the Rudy's Record Rack store wearing trenchcoats (3 of them carry guitar cases), is seen. Madame Olinsky's spy contacts in Red China forshadows The Monkees' nemeses in Episode No. 26, �Monkee Chow Mein�. The George Barris-built Monkeemobile appears in an actual episode of The Monkees as part of the story for the first time in �The Spy Who Came In From The Cool�; all prior appearances of the car were in The Monkees' main title sequence and the musical numbers. After Honeywell demonstrates the lamp where he's secretly hidden the microphone over which he hopes to record the spies� confession, David rubs the lamp and out pops a genie (Arlene Charles - with a covered navel, yet!) --referencing the show, I Dream Of Jeannie (NBC, 1965-70), which followed The Monkees on NBC in the 1966-67 season and in fact would take its timeslot @ 7:30 Mondays in September 1968 in the wake of its cancellation. Another reference to Jeannie can be spotted in The Monkees� 1968 motion picture HEAD; a female extra can be seen in a Jeannie outfit in a scene where Micky and Michael hedge bets on the fate of The Jumper (June Fairchild), who's threatening to jump. Other episodes of The Monkees to feature references to other Screen Gems shows are No. 15, �Too Many Girls� (a.k.a. "Davy And Fern") (The Iron Horse), and No. 32, �The Monkees On Tour� (Bewitched). Michael's introduction of the disguised Madame Olinsky and Boris as "Honey And The Bear" is a satirical reference to legendary music duo Sonny & Cher. When the CIS chief says he can save 3 of the four boys, all but Peter immediately rush for chairs. Michael consoles Peter by saying, "Well, I guess we're just gonna have to form a trio; we're gonna miss you, ol' buddy." Ironically, in 1968, after taping 33 1/3 Revolutions Per Monkee, Peter eventually was the first to leave the group, and Micky, David and Michael actually did indeed form a trio, releasing 2 more albums (Instant Replay [#COS-113, issued 2/15/69] and The Monkees Present Micky, David, Michael [#COS-117, issued 10/11/69]) before Michael's resignation in 1970. Peter breaks out in tears in the scene where Madame Olinsky demands for the microfilm from The Monkees @ gunpoint; thus sparking another first on The Monkees TV show: Monkees showing a display of emotion. BORIS: Madame, after we deliver the microfilm, then can we go away together as you promised? MADAME: Yes, Boris, we will go to Brazil! BORIS: I thought you told me Argentina? Monkee stand-ins David Price, Richard Klein and David Pearl appear as dancers in the discotheque. This marks the second utterance of the line "No more Mr. Nice Guy!" on the show, following Episode No. 1, �The Royal Flush�. �The Spy Who Came In From The Cool�'s third and final CBS reairing, July 1, 1972, took place 6 years to the day it compleeted production. Also on this date, another popular Screen Gems sitcom, Bewitched, formally ended its original network run on ABC-TV after 8 seasons, with a repeat of the December 29, 1971 episode "Adam, Washout Or Warlock," which featured Monkee guest Diana Chesney (�The Chaperone�). The late Arlene Martel (Mme. Olinsky) popped up again on this show as Loreli in Episode No. 50, "The Monstrous Monkee Mash." To fans of Star Trek (NBC, 1966-69), Martel is best known as T'Pring, betrothed to Spock (Leonard Nimoy), in that series' second season debut, "Amok Time" (9/15/67). She had a recurring role in the TV series Hogan's Heroes (CBS, 1965-71) as French spy Tiger, and fans of the CBS Daytime drama The Young And The Restless will also recognise Martel as Mavis MacDonald. Martel succumbed to heart failure on Tuesday, August 12, 2014; she was 78. The late Jacques Aubuchon (Boris) portrayed Tali Urulu on McHale's Navy (ABC, 1962-66). Aubuchon previously appeared with Ben Wright (�The Success Story�) in a March 21, 1959 episode of Have Gun Will Travel (CBS, 1957-63), "Incident At Boresca Bend," and with Henry Beckman ("The Picture Frame" [a.k.a. "The Bank Robbery"], "The Monkee's Paw") in a January 17, 1963 episode of The Twilight Zone (CBS, 1959-64), "Valley Of The Shadow." The late Billy Curtis (the Midget) was one of the original Munchkins (The City Father Of Munchkinland, to be exact) in The Wizard Of Oz (MGM, 1939), and the main reason for Judy Garland's comment that the Munchkins were "little drunks". He made several passes at her during the production, to which she responded "Mother wouldn't approve." Don Penny (Honeywell) previously appeared as Ship's Cook Charles Tyler on The Wackiest Ship In The Army (NBC, 1965-66), which was associate-produced by pre-Monkees producer Bob Rafelson (it was during this stint that Rafelson concieved of the idea for The Monkees). Booth Colman (The Chief) played Professor Hector Jerrold on ABC's General Hospital and Counselor Zaius in the ill-fated 1974 CBS Planet Of The Apes TV series (it also featured Monkee guest actor John Hoyt as Prefect Barlow in Episodes 2 & 9 of the series). Coleman served in the Japanese Language Division of U.S. Military Intelligence during World War II. Trivia Footnote: On the night before his appearance as The Chief in this episode, Colman guested on Bonanza (NBC, 1959-73) as Parley in the episode "The Pursued (Part Two)" (along with Monkee guest Vincent Beck). Fans of Get Smart will also recognise Lee Kolima (Yakimoto) as Bobo in the episodes (both written by Gardner and Caruso!!) "Diplomat's Daughter" (9/25/65; the first color episode) and "The Amazing Harry Hoo" (3/12/66); he also did a guest appearance in the TV series I Spy (NBC, 1965-68) as Kwan Tak in the September 22, 1965 episode "A Cup of Kindness" (airing in the same week as "Diplomat's Daughter"!). 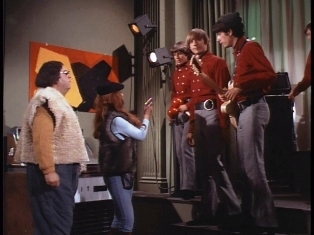 Kolima reappears on The Monkees TV show in Episode No. 52, "The Devil And Peter Tork", as Atilla The Hun, and in the movie HEAD in an unbilled role as the Tor Johnson-esque security guard whom David karate chops to the neck (again! ).